Hey, Friend! Breakfast Week over on Instagram has been so much fun this week! Have you checked your email yet? It’s Day 5 of #RNGBreakfastWeek and I’m talking all about mindfulness and setting intentions! I think this has to be my favorite topic yet! One of the most powerful eating habits you can cultivate is awareness. Make sure to check your inbox and read all about it! Tomorrow is the last of #RGNBreakfastWeek and if you’re sad you are finding out about it just now – don’t be! 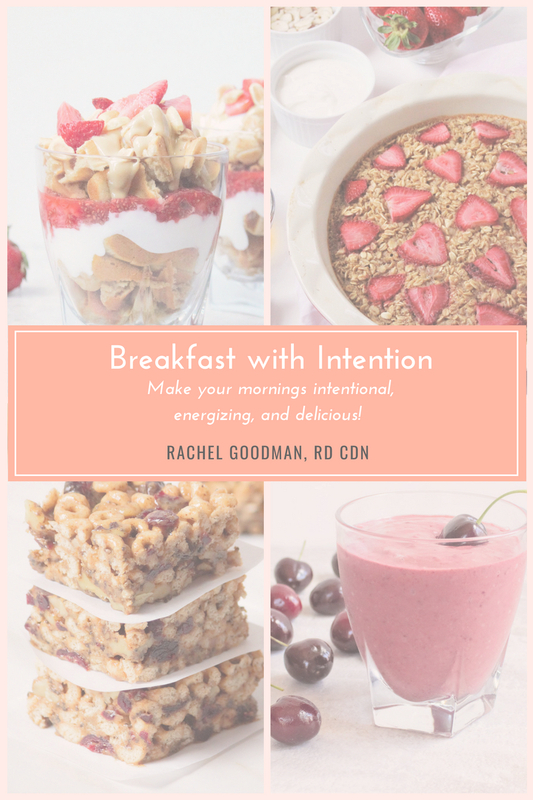 I’ve put together some breakfast and Intuitive Eating tips from this week and all of this week’s recipes plus a NEW recipe – all in one delicous and nutrition printer-ready place – in the Breakfast with Intention Recipe E-book! And you can get it right NOW! Sign up to get it below. Enjoy!! 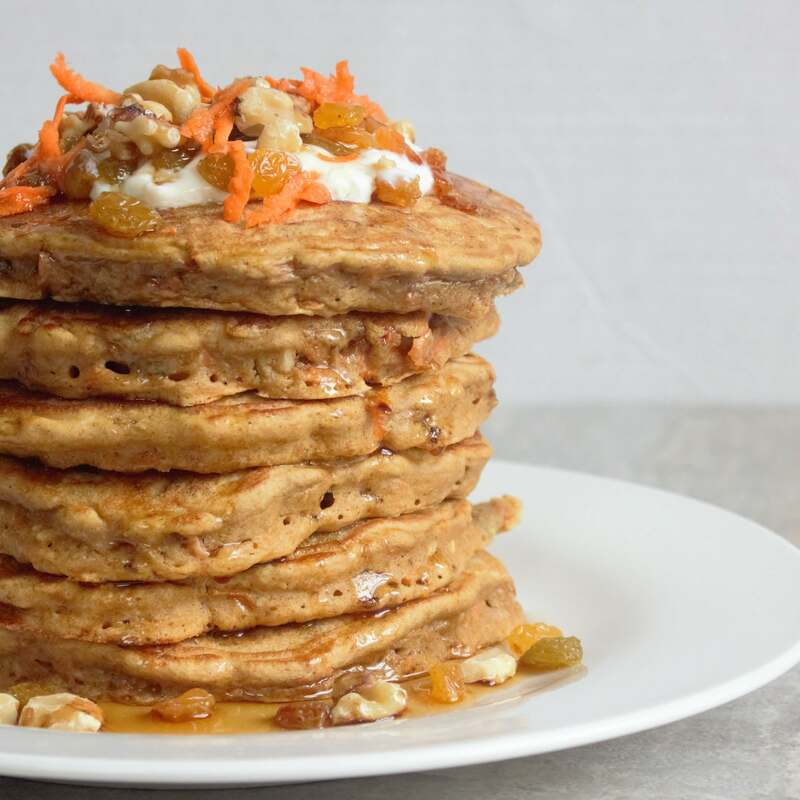 I’m seriously obsessed with carrot cake and I LOVE pancakes. 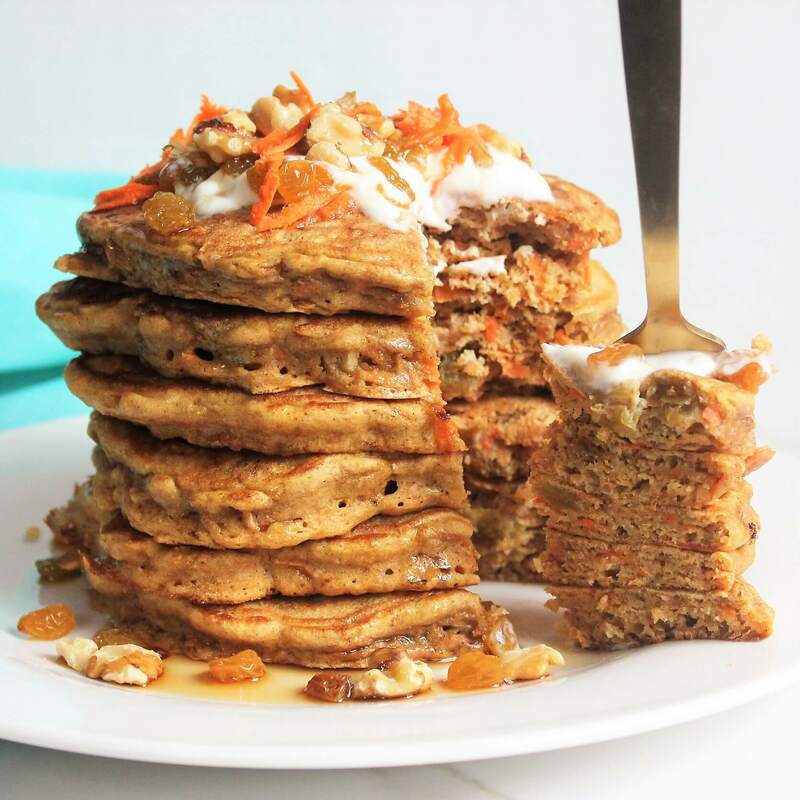 So you really can’t go wrong with Carrot Cake Pancakes! Who’s with me? Make a batch and then separate into ziplock bags and store in the freezer. 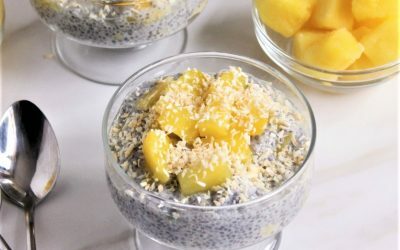 Defrost the night before or in the microwave for an easy and delicious breakfast that will only take 2 minutes to prep. Want more breakfast tips and recipes? Get it HERE! In a large bowl combine dry ingredients: white whole wheat flour, baking powder, baking soda, cinnamon, and salt. Set aside. Stir together milk and vinegar. Set aside for 2 minutes. It will curdle a bit. In a separate bowl, whisk together the milk, vanilla, egg, oil, and maple syrup. Pour wet ingredients into dry ingredients and stir just until combined. It’s okay if it has some lumps, you don’t want to overmix it or you will end up with a tough chewy pancake. 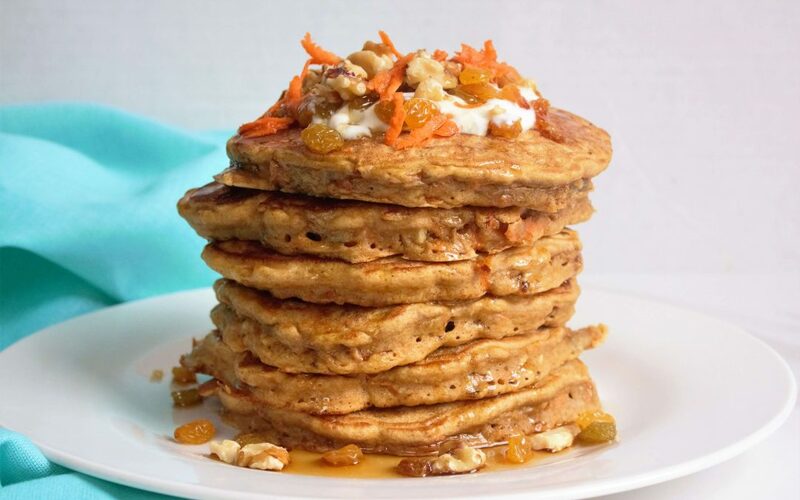 Fold in grated carrots, raisins, and coconut flakes just until dispersed in the batter. Heat griddle or pan to medium heat and coat lightly with oil. Pour ¼ cup batter at a time and allow to cook for 1 min or so – until the sides start firm up and the middle gets bubbly. Flip pancake and cook additional 30 seconds. Repeat until batter makes 6 to 8 pancakes. Top with sour cream or coconut whip cream, walnuts, coconut flakes, and maple syrup and enjoy!